Ayurveda is one of the easy and permanent ways to treat skin problems. One of the most irritating skin problems is pimple. You can say that girls fined pimples as their worst enemies. 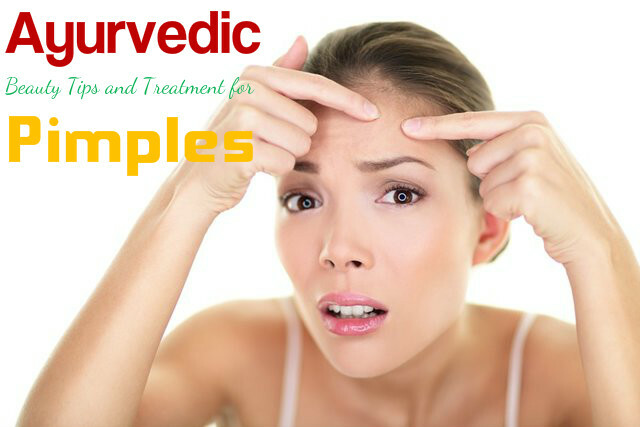 Ayurveda has simple, effective and basic remedies for treating pimples. It uses only natural ingredients, which do not cause any damage to your skin. However, if your skin is sensitive to any of the ingredients used, you must avoid those remedies and choose remedies using other ingredients. With the right kind of ingredients and regular use, you will get excellent results. Tulsi paste is very effective for getting rid of pimples if you use it regularly. If you do not have fresh basil leaves at home, then you can get a bottle of dried basil leaves from your nearest mall and steep some leaves in a little of water. Make a paste of it and apply on your face. Leave it for about 10 minutes and then wash off with water. Applying this paste 4 to 5 times a week can give you the desired results. Take some cloves and ground it to get a powder. Clove contains clove oil, which can give a burning sensation when applied on aggravated pimples. First you have to mix it with a little amount of water or milk and test it on a patch to see whether your skin is sensitive to it. If there is no problem, then you can apply it on your face. Dry roast cinnamon or dalchini and grind it well to get a fine powder. Now mix it with honey to get a paste. Apply this on the pimples and wait for 15 to 20 minutes. Now wash off with water. Repeat this treatment 5 to 6 times a week and you will get positive results. A mixture of lemon juice and honey will help you get rid of pimples easily. Take 1 tablespoon of honey and mix it well with 1 tablespoon of lemon juice that is taken fresh by squeezing a lemon. Apply this on the pimples and also on the spots that are left behind after the pimples goes off. Do not apply it on aggravated pimples as it can cause a burning sensation. Leave it for about 10 minutes and then wash off with water. Repeat it 5 to 6 times a week and soon you will start getting positives results. Neem leaves have been used from ages for the treatment of pimples. It has antiseptic and antibacterial properties and help in getting rid of pimples and preventing various skin diseases. Make a paste with neem leaves and apply it on the pimples. If you do not have fresh neem leaves, you can opt for dried neem leaves that you get from the market. Then you have to steep the leaves in water for a few minutes, make it into a paste and apply on your skin. Mint has astringent and cooling properties and therefore is great for the skin. Soak some mint leaves in water and then grind it to get a paste. Apply this freshly made mint paste on your face. It reduces the stubbornness of the pimples and also reduces their size. With regular use, you can get rid of the pimples as well as the pimple marks. Nutmeg or jaiphal is a spice and this is very useful for getting rid of pimples. Make a fine powder by grinding nutmeg and mix it with water or milk to get a paste. Apply it on the pimples and wait for 10 minutes maximum. Now you can wash off with water. You can use potato juice or grated potato, as well as slices of potato to treat pimples. Apply the juice of potato on your face and wait for about 10 minutes or a little more. Wash off with water. It helps you get rid of pimples and also mildly bleaches your skin, giving it a natural glow. The sticky white milk that comes out from the skin of raw papaya is very beneficial for treating pimples and acne. Apply it all over your face and wait for a few minutes. Then you can wash off with water. Using this regularly helps you get rid of pimples. Soak sesame seeds in water overnight and then make a paste of it to apply on your face. You also get sesame powder in the market, which makes it easier for you to make the sesame paste. Apply it on your pimples and then wait for about 10 minutes. Wash off with water. With regular use, you will see the difference it makes. Always keep your face clean so that no dirt or oil remains on your face. Do not touch or scratch pimples. This can cause infection to spread and results in more pimples. Use only clean towels to wipe your face as dirty towels can aggravate pimples. Make sure that your pillow cover is clean. Wash it at regular intervals. Try to use non-comedogenic makeup and skin care products without any fragrance. Cleanse you face regularly. It is also important to moisturize, hydrate and scrub your face at regular intervals. Now that you have seen how to get rid of pimples in a natural way, try following some of the tips given above and have a healthy and glowing skin that is free from pimples.